PHILIPSBURG – A disputed load of oil of Venezuela’s state oil company PDVSA, which is currently on board of crude oil tanker NS Columbus near St. Eustatius, will have to be pumped out and stored in a bunker at NuStar Statia Terminals. The Court of First Instance decided this in an injunction filed by PDVSA against ten shipping companies. The companies had placed a lien on the oil due to unpaid bills. The case was heard by the Court in St. Maarten on March 6. The Judge presented his ruling on Friday, March 10. PVDSA was represented in this case by attorneys Michiel Noordhoek and Hendrich Seferina of HBN Law, and the shipping agencies by Roderick van Hees and Carlos Winkel of VanEps Kunneman Van Doorne. Jointly, the shipping companies have a claim of approximately US $20 million on PDVSA. With the lien on the cargo consisting of approximately 552,000 barrels of oil with a value of some $22 million the companies wanted to secure the outstanding amounts. The tanker made a brief stop at Statia, during which it was chained due to the lien. Under the Russian corporation Sovcom Flot the 10 shipping companies rent out tankers, which PDVSA is using for transport. The monthly rent for tanker NS Columbus amounts to $900,000. Due to financial difficulties PDVSA has not paid the rent for quite some time, therefore the shipping companies called for a sale of the oil. The companies are operating under English law. Therefore, the contracts for the rent of tankers also fall under English jurisdiction. That is why a similar court case has been filed in England, in which the court has not yet made a decision. Under the existing contracts the shipping companies also have a retention right, which means that a creditor may keep certain goods under him and is not obligated to hand it over for as long as no payments have been made. 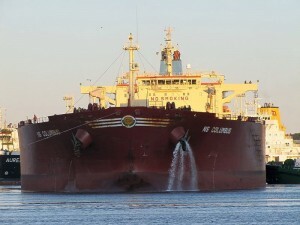 The shipping companies had claimed that the oil had to be pumped out of the tanker and be stored at the terminal to allow Columbus to continue its journey. During the hearing of this case it was stated that the sales order is to be expected around April 10. “The preliminary judgment by the Court is that it is suitable for parties to await the decision by the English judge,” the Court of First Instance in St. Maarten said. The shipping companies were against pumping the oil out as this may result in the loss of property, as the oil and the lien placed on the cargo would in fact change hands by pumping the oil in the storage bunkers which PDVSA rents at the terminal. “On the other hand, there are the interests of PDVSA which cannot use the Columbus and is obligated to pay rent every day,” the Judge reasoned. The Judged ordered each of the shipping companies to cooperate with the pumping and storage of the oil within two days upon receipt of guarantees in writing by PDVSA and NuStar. In case of non-compliance, the Court imposed penalties of $100,000 per day on the shipping companies, with a maximum of $20 million. The Court said that parties were responsible for payment of their own legal expenses. “We are satisfied with the outcome considering that the Court also stated that the decision in England should be awaited,” Winkel said. “Our clients wanted clear (bank) guarantees so that they can get their money. The Court ordered PDVSA to give such a guarantee,” Winkel explained.